Have been featured in Culturama in the Rising India story for Music. After a while I wasn't asked the usual questions. Thanks Poonam! 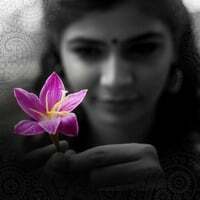 Chinmayi, you really are an inspiration to young aspiring girls out there. Your positive influence and energy transcends geographical barriers and reaches people like me, here in Singapore who marvel at your success. Every now and then when the going gets tough, you will need a moral boost, a kindle of your inner energy.. and this is precisely what i get whenever i read your blogs. I have yet to see a talent blessed with such humility and knowledge, and all at an age so young. Considering what you have achieved in these little years, I am sure you are going to be an epitome of successful women in years to come. I sincerely hope that life continues to bestow all that's good on you. Do you have the article? Hi Sis, I read yours in Kumudham. Your costume was good. And congrats for Filmfare. God Bless.. Love..
A different 'food for thought'!...though it sounds a little pungent., truth lies there...! nice article!! !